Happy New Year! It’s 2019 and I'm SO happy to put 2018 behind me. 2018 for me was a tremendous year of growth and learning and, believe it or not, lots of shedding. I don't just mean parts of my emotional self - I mean my hair, too. I am so thrilled and excited that 2019 is here, because I feel like so many of my projects are coming to fruition and I wanted to take a moment to say thank you to everybody who has subscribed to the blog and is curious as to what direction I will be headed. Truth be told, I was a little quiet in 2018, and for good reasons. I am a woman who is dealing with hair loss, so I like to talk about the fact that like I am living “the bottom up experience.” I am right there along with every single one of you trying to stabilize my own personal hair loss, trying to research new ideas, always working to be completely at peace. I’m not “on the other side” and now looking down from place of completion, telling you how it is and providing The Answer. In 2018, I went through a traumatic breakup with the father of my children. I would say I was very unhappy for many, many, many years and it manifested itself toward the final hurdle of this relationship in a way that caused me a tremendous amount of stress. It was that kind of stress that is that awful silent stress. I went to work every day. I was happy, I was joyful, but trying to sleep at night caused me such suffering and pain. I was panicking. I was nervous. I was having anxiety. I was grinding my teeth. I didn't understand that this was how stress was manifesting in my life. Everything seemed fine when I was busy and engaged, but the minute I hit the pillow, my heart would race. I would have these horrible, fearful thoughts of bad things happening to my children. I also gained weight and I didn't even realize how quickly and fast that was all happening. For many years, I was gluten and dairy free and I went back to eating gluten and dairy. Let's just say my lifestyle was suffering and I was definitely not the happiest I had ever been. I mean, I just was absolutely not right. You know that I have inherited Androgenetic Alopecia (AGA). I've worked very hard to stabilize my hair loss and do the things in a dynamic way that work for me. You've all read my blogs, so you know that I use a laser cap, I use topical treatments. I research everything. I don't just try new things, I stay with the course, I do it all. I was still doing all of that, while all of a sudden, my body reacted and I jumped into total Telogen Effluvium- stress related hair loss. I remember the day clearly: I was in the shower washing my hair, and all of a sudden, a clump of it came out. Now, you can imagine for me, that was very odd because I do everything completely by my plan with my focus on managing the shedding. Androgenetic Alopeica is not your typical shedding type of hair loss. AGA is a little bit more slow, gradual over time. I had this chunk of hair coming out. So, during that stressful time period, it hit me that this was bigger than the usual stresses of life. So while I have inherited AGA, I then had stress-related hair loss. DOUBLE WHAMMY! UGH! Fact: you can have many different types of hair loss happen at once. I decided to take charge and that day I decided I was going to get my life back together and deal with the fact that I just hadn't been myself, for a very long time. We talk about hair loss in terms of it being reversible or irreversible, and Telogen Effluvium is something that can be reversed. Many people go through Telogen Effluvium and it is usually a temporary and reversible kind of hair loss that happens with the occurrence stress or shock, or some kind of traumatic event, hormones, medical, etc. 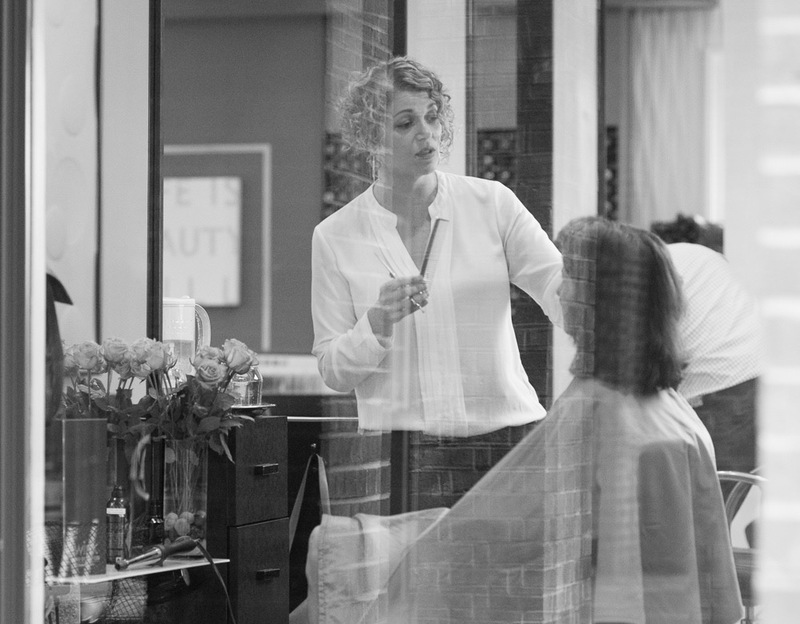 When you're a hairdresser like me, you're on a journey of hair with your clients, but you're also on a journey of their lives, and you will see all sorts of things that will affect their day, their health. You’ll see shocks to the body like pregnancy, a car accident, or stress from something traumatic in their personal lives, like an affair. Did their spouse have an affair? Did they have an affair? I mean, that is a normal thing that, honestly, I see and hear in the salon. Death of a close family member. Are they on medication? Did they have some diet change? Did they go keto very quickly? Did they have any kind of surgery, did it require anesthesia? Are their hormones changing post-pregnancy? Have they been taking lots of pharmaceuticals? Is something kind of hormonally or metabolic happening with them? There are so many different questions and possibilities. Telogen Effluvium can be reversible if you're suffering from one of those causes, those triggers. For me, the trigger was the massive stress I was undertaking in my personal life. I wasn't sleeping. I literally was experiencing true stress. My guts and my insides were a mess. I got my trigger, and once the trigger happens, you just have to let that TE do it’s thing. The minute my hair was shedding, I knew I had to look back and, of course, looking back six weeks, eight weeks, three months in my past, I knew that's when I was suffering, truly suffering, the most. That's when I was literally stressed to the max. Worrying, stressing, not eating. My guts were all messed up. Having that sign in the shower and having my hair coming out in clumps, I realized, “okay, now I have a combination of AGA plus TE. I see it in the salon all the time, there are a multitude of things you can have at once. A lot of times, people don't just have anything traditional, they don't just have AGA, they'll have AGA plus TE, or AGA plus something else, some kind of fungal infection on their scalp, or they will have other kinds of things going on - there are so many different combinations that you can attribute to hair loss. You can be doing very well, like I was, for many years, taking care of my hair and then all of a sudden, boom, a stressful event happens. But I knew what to do, I was pre-programmed. I knew that my Telogen Effluvium had to run it’s course. Many people don’t know what his happening to them. How did it affect my hair? Well, it affected my hair, obviously because I had diffuse shedding. All of a sudden, my hair started to feel a little fuzzier and things started to look a little flyaway. Everything felt limp. It did not have the same kind of volume. I had to deal with coping around my personal separation a little bit of a different way. I had to find better ways to carve out more sleep. I had to get my exercise routine in more consistently. I had to do everything in my power to help deal with the trigger (personal stress). I looked into my workplace. I looked at my home life. Luckily, you know, every day is a new day as you get closer to the finish line of being separated, but it really, really, really affected me. I started implementing everything that I tell everybody to do, but extra. I started using the medicines that I used for my hair TWICE a week, as opposed to once. For me, that's Rene Furterer’s Triphasic. I was making sure I was regularly spacing out more Olaplex treatments. I made sure I was taking my vitamins regularly. I was eating foods that were very, very rich in Vitamin D and Vitamin C. I went full blast into that direction - I was going to take the very best care of myself, and I was going to take the best care of the hair that I had on my head. I knew it would take many, many months to get to the point I wanted to be, but ultimately, I was really taking the best care of myself. So, now it is the beginning of 2019 and I feel very confident saying I made it through that place. I completely controlled and stopped my shedding. My hair is now looking better than ever. Really! I also want to say that through that tough time, I did something crazy - I bleached the crap out of my hair. I gave myself a ton of highlights. I knew I would have to deal with some chemical damage, but I wanted to go a little bit more blonde, and I knew I was taking the right steps to allow myself room for that temporary change. You gotta do what you gotta do! I kept looking at all the things that I do on a daily basis that help me engage with the world and all the things that were going right versus the things that were going wrong. The things that were going right were my relationships with my children, and I still actually have a great relationship with my children's father. I want to remind everyone that using our coping skills, following our vision and constantly looking at a macro-picture all the time, is what it takes to have a big life. What does it take to have a happy life? Those are the things you need to rely on when you seek solutions for yourself, or seek to find the big picture for yourself, for your life.
. All. The Time. Remember, it's always about taking the best care of the hair that you have on your head and understanding when things like this might happen to you, understanding what could be reversible, what could be irreversible, what is temporary, and what is not temporary, and at the end of the day, looking at the big picture and saying: so what? What would I really do if I lost all my hair?